This is it. Forward month WTI has closed below $100, at $95.71. The Series is officially over. We are no longer driving demand: beyond China, ... it is oil producers like Iran, Saudi Arabia, Russia or other Gulf countries that are ... driving demand[. T]his is unlikely to change. All those that blame speculators have had to increase the "real" price at which oil should trade, according to them, if there weren't speculation....Speculation is a minor issue. oil has been extraordinarily cheap. Now its price is noticeable, but not yet unbearable, for the majority. It will go high enough as to be painful for large numbers of people, and we're still very far from that. A price of $150-200 seems possible - likely even - but predicting a DECLINE to $75 after 2011?!?! Is that really possible? "I don’t know how else to say it, this is not a bubble," Jan Stuart, global oil economist at UBS, said. "I think this is real." This is denial pure and simple. you can have my milkshake. it is just too convenient, too irresistible and, let's say it, too comfortable an excuse that speculators are to blame. It's not our fault, we have our scapegoat. Our price increases are temporary, we'll soon be back to "normal" lows, as soon as (take your pick) speculators have been punished/oil companies are taxed for their profiteering/"fundamentals" are left toset prices. There are A LOT of reasons why oil prices are going up. Oil prices have gone from ridiculously low to noticeable/annoying. They have not yet reached the pain threshhold for large parts of the population (they sure have for some, but that's not yet enough). Since these suggestions are not practical, as you rightly note, prices will go up very, very, very, high. This is not gloating, or anything like it. I'm simply providing a warning, which is just an opinion, but one backed by an increasing array of facts on the ground. 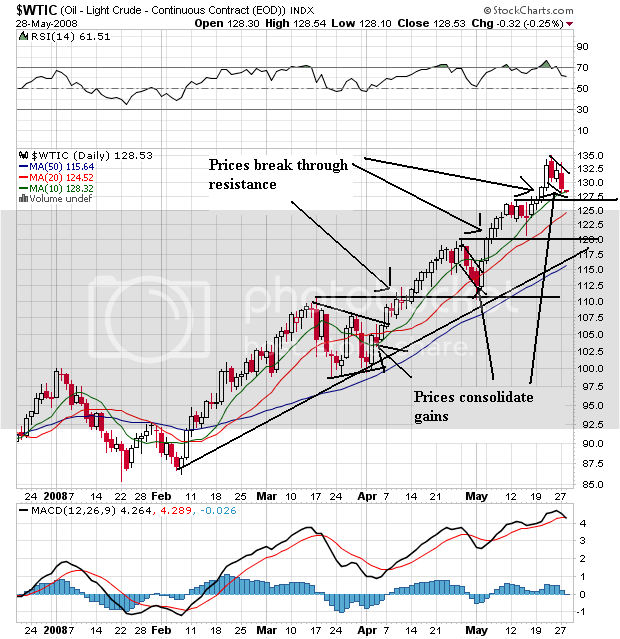 - July 1, 2008 (only 10 days before Oil hit its high of $147 and started to decline). This is exactly what a bubble looks like. After a sustained, nearly one-way move continues long enough, the opinion that the trend will continue are "backed by an increasing array of facts on the ground," and not only is the "story" compelling, but the "story" has been right for so long that almost nobody dares state a contrary opinion. Opinion becomes ever more one-sided as the price moves in a "parabolic" fashion (i.e., increasing at an ever-higher rate) which is exactly what Oil did in 2007 and early 2008. What we know now, that Oil-bubble boosters didn't know a few months ago, is that much of the demand in Asia, particularly China, wasn't "real." It was buttressed by large consumer subsidies, subsidies that started giving way in June. And far from the assertion that "Chinese demand growth is very real, it's very large, it's highly likely to continue for a number of years", in fact Chinese demand growth was "Hoarding in Plain Sight", foisted on the private sector in the lead-up to the Olympics; and it didn't last past June. In July the Chinese government allowed private companies to stop building up their hoards, and Chinese demand for Oil promptly declined. Once the Oil bubble began to burst, not even August Hurricanes in the Caribbean could stop the decline to $100. Just as speculators caught short on the way up got blown away, so too did speculators caught long on the way down. The final nail in the coffin, a decline below $100, took place on the special very first NY Mercantile Exchange trading session in reaction to Hurricane Ike making a direct hit on Houston Saturday morning. So what now? Just as in 2006, the last Congressional election year, Oil has declined going toward election day. If the same seasonality holds up, further declines for the next couple of months are in the cards. So what is my next prediction? Well, this I can state with great certainty: Oil will hit $200 before it hits $0. Oil continued to collapse today, closing at $91.15, after falling as low as $90.51 a barrel. This means that Oil is down almost $10 in 2008, and only about 15% higher than at this point last year. This was not a "rational" move, any more than the sudden moves from $121 to $139 a barrel were a few months ago. This move, more than anything else, probably reflects (1) margin calls, as speculators caught long when Oil fell below $100 had to liquidate; and (2) forced liquidation by those who have to sell their "winners" in order to raise funds to cover other liquidity requirements (e.g., banks, insurance companies, pensions, hedge funds). So it would be no surprise at all to see the price of Oil "boomerang" at least temporarily back over $100. I'd love to see some analysis on speculators. We kind of dropped that ball and while we have claims speculators drove up the market, then the downside of this must be true for that claim to be valid.